World Rhino Day is an international ecological observance celebrated on September 22. It was inaugurated in 2010 to raise awareness of the need to protect the five existing species of rhinoceros: white rhino, black rhino, Indian rhino, Javan rhino and Sumatran rhino. Rhinoceros, often referred to as rhino, is a group of odd-toed ungulates. Members of the family Rhinocerotidae are large herbivorous animals. They are characterized by a very large horn, for which they are killed by humans. Rhino horns are bought and sold on the black market for their presumed therapeutic properties (although in reality they don't have any). Due to extensive poaching, three of the five rhino species are listed as critically endangered. World Rhino Day was conceived in 2010 by WWF South Africa, one of the national offices that comprise the World Wildlife Fund network. It was dedicated to the protection of African rhino species, the white rhinoceros and the black rhinoceros. The following year, the observance went international and encompassed both African and Asian rhinoceros species. 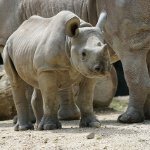 Although rhinoceros can be found only in Africa and Southern Asia, World Rhino Day events and activities are held in many countries outside these regions, from Australia to the United States. The celebration has become a worldwide phenomenon that unites non-governmental organizations, cause-related organizational, zoos, businesses and concerned members of the public on six continents.